When I first started taking riding lessons as an adult in my mid-thirties, I had a wonderful riding instructor. She taught riding in the arena for three lessons a month but on the fourth (and best) week we went for a trail ride. Everyone in the class loved trail riding week. Our instructor wanted us to enjoy riding on trails as much as we did our lessons in the arena and she wanted us to be safe and schooled in proper trail etiquette. Since then I have logged many hundreds on miles on trails. Some of those rides have been high points in my life, but some of those rides have been less than ideal. I prefer that ALL my trail rides (and yours) are safe and fun. So, with that in mind, here are some basic rules to keep you and your trail mates safe and sound. Designate a trail boss or leader for the ride. Always ride at the level, and speed, of the least experienced rider. Ask everyone in the group what speed they are comfortable traveling. Ask the group, and get consent, from everyone before increasing speed. Maintain at least 10 feet between horses at a walk, larger spacing at faster speeds. Never ride up behind, or along side, of another horse. Warn others if your horse is a known kicker and tie a red ribbon to its tail. Always ask permission before passing the horse in front of you and never pass at a cantor or gallop. Pass on the left side of the horse in front of you for safe passage. Notify the rider behind you of any danger and ask them to pass it on to the riders behind them. Warn other riders before you pull out your rain gear and put it on as the sound might spook a fellow horse. Carry a cell phone and keep it on your body. It does you no good if your horse gallops off with your phone attached to the saddle. At least one member of the group should carry a trail map when riding on unfamiliar trails. Designate one person to carry a first aid kit. 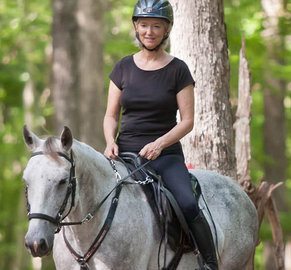 Wear an ASTM/SEI approved helmet every ride and replace it after any falls from your horse. Do not leave a water source until all horses are finished drinking and when your horse is done, move down stream or out of the way so other horses have a chance to drink. Wait for those who are opening (or closing) gates and never move out after any stops until everyone is safely mounted on their horses. Always return to the barn or trailer at a walk. Be sure to carry out everything you have brought with you. Leave no trace behind, if you drop something ask the group to stop while you retrieve it. Keep manure picked up and carry it home in your trailer or dispose in designated dumping area. Be courteous and friendly to others you meet on the trail. You just might make some new riding buddies. So many years later, I know I need to school my horse in the arena sometimes, but trail riding will always be my favorite way to spend time with my horse and my friends. In summary, please remember that we’re all out on the trail to relax and have fun. Follow the basic rules of trail riding etiquette and others will enjoy riding with you. As my favorite childhood cowboy, Roy Rogers, said … Happy trails to you … (you old riders know the rest of the song).